The Venmar Air Exchanger, for a healthier environment. It’s a fact: Today’s homes are so well insulated that they trap humidity and pollutants indoors. Result: Over 50% of homes show visible signs of humidity. However, it is possible to breathe fresh air inside as if you were outside and fully enjoy your home. According to specialists, central ventilation and filtration effectively eliminate airborne pollutants and excess humidity, thereby protecting your family’s health and the structure of your house. Ventilation is a necessity. But what is the most cost effective way to ventilate while retaining the energy used for heating and cooling? 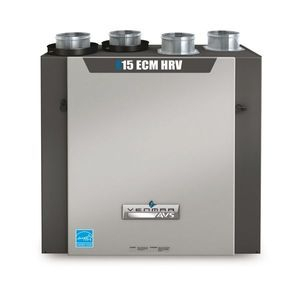 Venmar offers a wide range of air exchangers with Heat Recovery (HRV) and Energy Recovery (ERV) technologies. These technologies help to minimize loss of heat or coolness as follows: The HRVs transfer heat from exhaust air expelled from the house to the fresh air entering the house, without mixing the stale air and the fresh air. In addition to this feature, the ERVs limit the amount of moisture entering the house (ideal for humid climates). Venmar units: Fresh air at low cost!